Allways time for Monkey business. 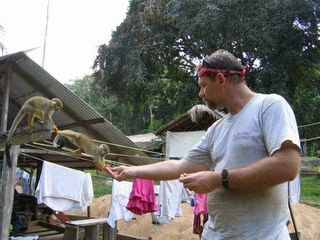 These are spider monkeys, getting a treat of Plantain. Our lives here are busy with the assembly and erection of this timber building. And we have in some ways overwhelmed this little community with our tools, big timbers and sprawl of gear, that it will never be the same again. We’ve also fit right in. There are 3 cooks in the Kitchen who keep us well feed with some amazing chow, the locals come and help us during the day on the frame and the children that live here all find us friendly. We like them too. 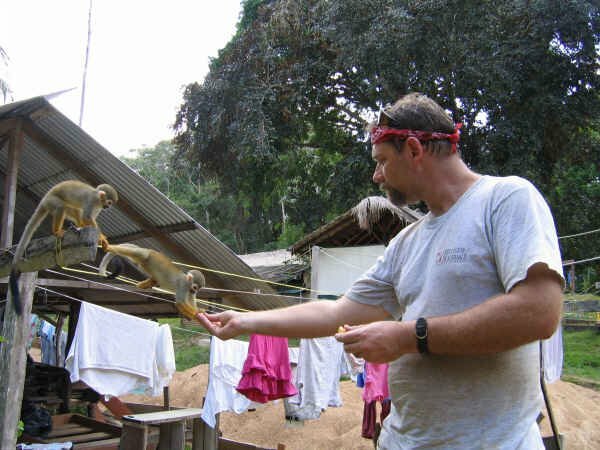 I had not seen the monkeys who hang around the village until lunch today (Sat) when the kitchen help offered me a plantain (like a banana) to feed them. As soon as they saw this, they tuned right in, coming down to see who could get the first treat. All I had to do was hold up the small piece and they would take it right from my fingers with a very gentle hand. Some even carefully guided it to their mouths while I held it up. Then of course, the fight broke out---someone got a piece and someone else decided to take it. It was like a siren went off…. screeching and chirping the whole bunch went into this crazy frenzy in the bushes. Everything settled we all moved on.